So many of us a re inundated with big bodacious ideas that we want to accomplish – buying a house, getting a new job, painting the house, going on the dream vacation, or maybe planning a new career. How we get these life milestones accomplished is a matter of style. Last week, we lost a woman of great style and grace, whose focus on helping others will live on: state Senator Dorothy Hukill (R-Port Orange). Senator Hukill was a Yankee transplant from New York with impressive education credentials that included Hunter College, Columbia University, and St. John’s University School of Law. A former school teacher turned attorney, Hukill chaired the Senate Education Committee. One of the last bills she sponsored and worked on for several years through this past session was SB 88, which would revise the required credits for a standard high school diploma to include one-half credit of instruction in personal financial literacy and money management. Senator Hukill believed that no matter what education level a student ultimately achieved after high school graduation, each needed a solid foundation in conducting their own personal financial affairs in a responsible way to help secure a bright future. Although her bill failed to pass in the last hours of session and she lost her fight against cancer last week at the age of 72, her style and dedication to public service live on in those whose lives she impacted. It was with Senator Hukill in mind that a wonderful meeting came about between me and one of her fellow legislators, who shared a wonderful theme that is worth remembering. He and I were talking about how we can engage Florida’s youthful generation to enter technical fields like plumbing, electrical and other construction trades. We realized that many believe going to college is their only way to have a meaningful career and I laughed and asked, “What did it cost you the last time a plumber came to your house for an hour?” He and I started thinking big in terms of promoting among the high school counselors ways they could steer high schoolers to these service positions and right then he called his local high school principal and had the conversation. Talking about starting small! The point is that it takes each of us to talk to our state’s future leaders about what careers are available in these skilled trades positions and one at a time, we will grow these ranks. What issues do you have that you want to tackle? Please share with us your plan of attack. If you don’t have one then start musing – Think Big, Start Small, and Grow Quickly! Next up? Our incredible smorgasbord of meaty tidbits! The Florida Supreme Court has been asked to weigh-in on last month’s lower court ruling that an insurance company is within its right to require an Assignment of Benefits (AOB) contract be approved by a mortgage company or anyone else with an insurable interest in a property. Both plaintiff Restoration 1 and defendant Ark Royal Insurance have asked for the Supreme Court’s review of the Florida 4thDistrict Court of Appeal (DCA) caseciting a conflict with the 5thDCA, which ruled last year that Security First Insurance could not impose such a restriction per Florida statute. While we await whether the Supreme Court takes up this appeal, it’s now clearer than ever that AOB abuse runs deep and wide across insurance lines and that the Supreme Court’s intervention in some cases is questionable. We at LMA try to connect the dots and see developing trends. William Large, president of the Florida Justice Reform Institute has done just that in his recent commentaryappearing in the Insurance Journal. In it, he points to two recent cases decided by the Florida Supreme Court – one involving bad faith and the other involving non-economic damages in a personal injury case – where dissenting justices have rightly noted the Court lacked jurisdiction because the lower courts’ rulings did not expressly and directly conflict with a prior Court decision on the same question of law. In other words, the Florida Supreme Court exceeded its authority to rule in these two cases. In a familiar refrain of “just because” they can, they did. Just because trial lawyers can file lawsuits when they want to. Just because an activist segment of the Supreme Court can take up cases and rule. Where is proper process and deliberative thought? A new report from the Insurance Research Council estimates that Florida’s third-party bad-faith legal environment added an average of $106 in claim costs to every insured vehicle in the state in 2017, and resulted in a total of $7.6 billion in additional claim costs over the past 12 years. Another symptom of this craziness pervading Florida’s insurance market is in a disturbing article in the Daytona Beach News-Journal. This one involves AOB abuse in automobile personal injury protection (PIP) insurance cases. The newspaper reports that the number of small claims cases in Volusia County more than doubled in a one-year period (from 4,500 cases in 2016 to over 12,000 in 2017). One local law firm alone was responsible for 8,400 of those cases. In one case, lawyers for that firm of Simoes Davila were awarded about $40,000 after winning $790 for their clients, mostly medical providers. Florida’s one-way attorney fees law requires an insurance company pay plaintiff attorney fees if the company loses the suit or even settles for just a dollar below its initial claim payment offer. As we’ve reported beforehere in the LMA Newsletter, this law together with the bad faith law, provide incentives for perverse behavior on the part of the trial bar. There are just a handful of attorneys and firms that are mentioned when we discuss this gaming of the system. It gives those trial lawyers who do right by their clients and the greater system a bad name. One solution I’ll be recommending to the chief judge of the Volusia Circuit: set up an alternative resolution system. I’d welcome my readers input and involvement in this effort. Failure of the legislature to act to fix these two laws, together with the AOB statute, will essentially amount to a de facto “Trial Lawyer Full Employment Act” in 2019 at the growing expense of Florida’s six million property insurance policyholders. Key changes to the workings of the National Flood Insurance Program (NFIP) that we’ve been sharing over the past few months officially took effect last week. The Federal Emergency Management Agency, which oversees the NFIP, has changed a range of provisions that impact consumer choice, commission rates, and should further encourage the growth of a much-needed private insurance market. Gone is the no-compete clause that prevented the 70 or so private insurers participating in the NFIP’s Write-Your-Own (WYO) program from offering their own private policies. That’s expected to incentivize those companies to push more of their own private policies instead. Another incentive is a reduction – from 31% to 30% – of the compensation that NFIP pays to those WYO companies. About 85% of NFIP policies are sold by the WYOs, who are paid to service the policies, while the NFIP pays any claims. The Congressional Research Service reported the no-compete clause has kept many private insurers from writing in the primary voluntary marketplace. Also under the changes, NFIP policyholders will now be able to cancel their policies and get their unearned premiums refunded, to apply to private insurance policies. Prior to this, a policyholder could only switch policies at renewal time unless they wanted to pay for both policies. The changes are seen by many in the industry as game-changers, especially in the continued absence of long-term NFIP reforms by Congress. Private policies have many coverage benefits over NFIP policies, including offering limits beyond the NFIP’s $250,000 for residential and $500,000 for commercial structures, and business interruption coverage. “By eliminating regulatory impediments, FEMA demonstrates its continued commitment to increase the number of flood insurance policyholders, while protecting taxpayers,” said the Reinsurance Association of America in a statement. The changes also formalize the NFIP’s informal practice of increasing loss adjustment fees when needed to secure qualified field adjusters after catastrophic events. The next round of changes are set to take place this January 1. They include the first step of phasing out federal subsidies in flood insurance. Properties built before 1975, prior to Flood Insurance Rate Maps (so called “pre-FIRM” buildings) will see rate increases. Those designated as “severe repetitive loss properties” and those with substantial lifetime damage will see rates increase 25% annually until full-risk rates are achieved. “Severe repetitive loss properties” are those for which the program has either made at least four payments for buildings and/or contents of more than $5,000 or at least two building-only payments that exceeded the value of the property. Although these properties represent just 1% of the NFIP’s 5.1 million policies, they represent upwards of 30% of flood claims. These changes in the NFIP also spread the growing flood risk to private insurers and away from U.S. taxpayers, in a federal program that is still $20 billion in debt, despite a $16 billion infusion last year by Congress following Hurricanes Harvey, Irma, and Maria. 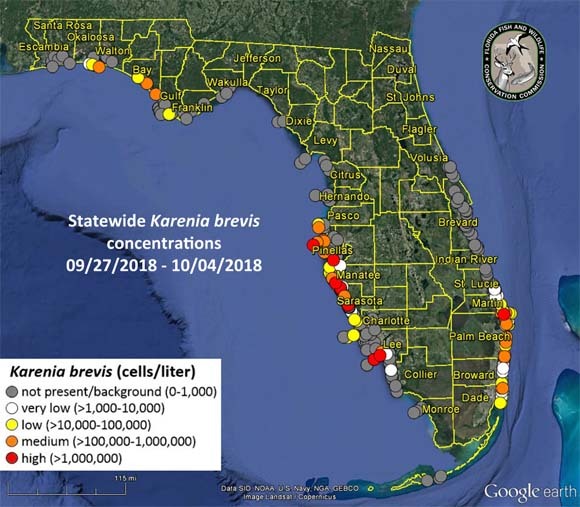 The Red Tide inundating Florida’swest coast from Naples north to St. Petersburg is now on Florida’s east coast and prompted the closure of four beaches for one day last week in Miami-Dade County. Some beaches in Palm Beach County were closed over the previous weekend in what’s described as lower red algae levels than those on the west coast beaches. Meanwhile the company providing cleanup of the inland blue-green algae blooms is making progress and is pitching a plan it says could prevent those blooms in the future. Beaches in Miami-Dade County north of Haulover Park in Miami-Dade County were closed this past Thursday as a precaution before re-opening Friday under the watchful eyes of state scientists. People with severe or chronic respiratory conditions were warned to stay away and signs were posted at beaches to inform visitors about potential risks. Only one beach had moderate levels of the naturally occurring red algae, which taints the normally blue seawater into a reddish-brown tint. Going into this past weekend, officials warned that the upcoming King Tides, which sometimes create minor street flooding in Miami-Beach, could contain the red algae. The Florida red tide contains toxins that have killed more than 100 tons of fish and other sea vertebrates on the west coast. The toxins can also become airborne, leading to respiratory irritation and for people with respiratory conditions, can cause serious illness, according to state officials. You can read more here. The toxins can also accumulate in oysters and clams, which can lead to Neurotoxic Shellfish Poisoning in people who consume contaminated shellfish. Meanwhile, Florida continues to suffer blue-green algae blooms occurring on inland waterways in both southwest and southeast sections of the state. Those blooms are created by excess nutrients released from Lake Okeechobee and stretch to the Gulf of Mexico and Atlantic Ocean. The company contracted by the state to clean up those blooms continues to make steady progress. AECOM is utilizing specially designed floats that skim the water and collect the algae, which is then sucked through flexible tubes into a holding tank aboard a boat. Once it’s treated with chlorine, the solids go to a landfill and the liquid is processed until it’s clean enough to drink, then injected into a deep well. Based on its extensive experience, AECOM has developed an innovative harvesting technique that it says could prevent such blue-green algae blooms in the future. The company has proposed building an algae harvesting plant to clean phosphorus from upstream inland waters before it reaches Lake Okeechobee. They can then harvest fresh algae to produce commercially-viable products, such as shoes and fiber boards. AECOM has created this short cool video you can watch here. The state of Florida is now making available $3 million in grants to east coast counties to mitigate and combat the red tide. That’s on top of the $10 million so far made available to impacted west coast counties. It includes money for tourism recovery and marketing programs in coordination with Visit Florida. You can read more hereabout all of these programs and their associated expenditures. Jobs, Wages growing, but rental cost burdens the highest in the U.S. Despite temporary tourism setbacks created by the red tide and algae blooms, Florida’s economy continues to grow, grow, grow! Among the expanding businesses is Florida’s largest private company and certainly one of its best known: Publix Super Markets. I grew up 15 minutes from the Publix headquarters in Lakeland. My grandfather, who ran a small business, was friends with Publix founder George Jenkins. Publix has announced it will add 200,000 square feet to its headquarters and another 700 employees to its payroll by 2027. Since construction on Publix’s current corporate office was announced in 2001, Publix has entered three additional states, more than doubled its annual sales, opened more than 500 new stores and added about 70,000 associates. The employee-owned grocer employs about 193,000 people. Fortunemagazine ranked Publix #1 on their 2018 list of World’s Most Admired Companies in the Food & Drug Stores sector. The company’s 2017 sales totaled $34.6 billion, with profits of $2.3 billion, ranking No. 88 on the Fortune 500list of U.S. companies for 2017. Publix isn’t the only one hiring in Florida. One in four small and mid-size companies say they plan to add full-time employees in the next six months. The PNC Bank Fall 2018 Economic Outlookincluded telephone surveys with 150 Florida business owners. One in three companies say they plan to increase pay for workers in the next six months. While 24% will be hiring, those expecting to reduce the number of full-time and part-time employees fell to record lows, less than 1% and 2% respectively. 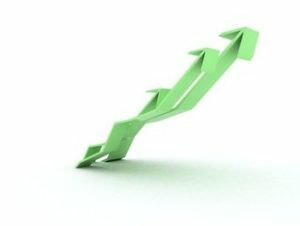 Just over one in three (36%) of Florida business leaders described their outlook for the national economy as optimistic, the third-highest ranking in the 10-year survey. Similarly, 46% are optimistic regarding their own businesses for the next six months, a drop from the historic high of 58% this past spring. For some though, wages still can’t keep up with the rising costs of rental housing. Florida has the highest cost burden rate in the nation for renters, at 56.4%.For the second year in a row, the tri-counties of South Florida rank as the worst metro area in the nation for renters. The 2018 Apartment List Cost Burden Reportnoted nearly 63% of renter households in South Florida were cost-burdened, meaning they paid more than 30% of their income on rent – just slightly better than 2016 figures and from its peak of 65% in 2011. Those considered severely cost-burdened, spending more than half their income on rent, amounted to nearly 34%. Nationally, the share of renters who are cost-burdened fell slightly from 49.7% in 2016 to 49.5% in 2017. This is the sixth straight year that figure has decreased. The 2017 cost burden rate is the lowest since 2007. The number of people with commercial health insurance in Florida continued to decline in 2017, according to the latest annual report from the Florida Health Insurance Advisory Board (FHIAB). About 96,000 fewer people have health insurance, a 2.5% drop from 2016. The numbers include those with Affordable Care Act policies but do not include those on Medicaid or Medicare. The report notes that at year-end 2017, 1,653,843 Floridians were in individual plans, a 2.68% decrease from the previous year. Small Group enrollment also dropped, falling 4.51% to 523,034 people. Large Group enrollment (those companies with more than 50 employees) increased just slightly (.06%) to 1,532,920 people. Recently released U.S. Census data shows 2.6 million Floridians — about 12.9% of the state population – were uninsured at some point last year. That’s up from 12.5% in 2016. Florida ranked fifth in the nation for the number of uninsured, behind Georgia (13.4%), Alaska (13.7%), Oklahoma (14.2%), and Texas (17.3%). 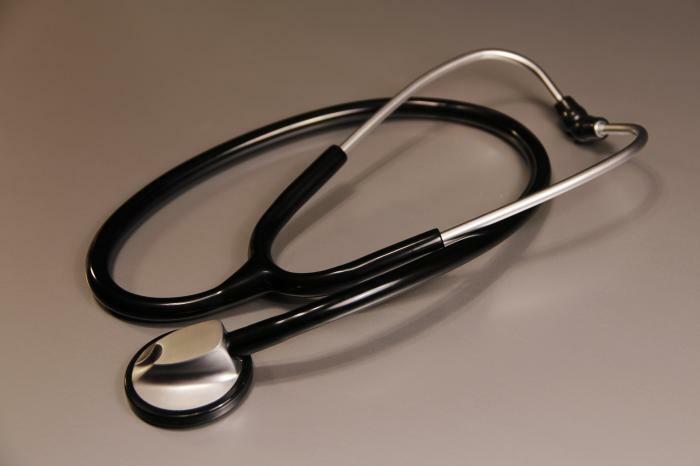 Florida lawmakers have chosen not to expand Medicaid eligibility under the Affordable Care Act; 33 other states have done so. Census data shows that nationally about one in four uninsured people were ages 26-34 and one in five were ages 34-44. The FHIAB report noted that while the number of people with health coverage decreased, insurance companies’ premiums increased by nearly 6%, with total premiums of $20 billion in 2017. Insurers have long noted that fewer younger and healthier people are purchasing health insurance, creating an imbalance that increases upward pressure on rates. The FHIAB was created by the legislature in 1992 to promote the availability of health coverage to small employers. Its mission was expanded in 2005 to include an advisory role on health insurance issues to the Florida Office of Insurance Regulation, Agency for Healthcare Administration, Department of Financial Services, other executive departments, and the legislature. Amendment 3is one of only two amendments on next month’s November 6 ballot that was created by a citizens’ initiative, where signatures had to be collected to place it on the ballot. This proposal would give Florida voters the exclusive authority to decide in the future whether casino gambling should be allowed in Florida beyond the current Indian reservations, which are controlled by federal laws. The Florida legislature has a standing committee that in the past has examined whether and how to legalize casino gambling, beyond the existing handful of dog tracks, horse tracks, jai ala frontons, and slot machines that exist at those facilities in select counties. This amendment would supersede legislative decision-making and leave it to the voters exclusively to decide on the fate of any casino proposals in the future. Under the proposed amendment, “casino gambling” does not include pari-mutuel wagering on horse racing, dog racing, or jai alai exhibitions. Likewise, the measure does not limit the right of the legislature to exercise its authority through general law to restrict, regulate, or tax any gaming or gambling activities. Supporters of the amendment have long-supported such a measure as a safeguard against special interests from unduly influencing legislative policy decisions on casino gambling, as well as to preserve Florida’s family-friendly culture. Opponents argue that the amendment could remove some existing slot machines costing schools $250 million in tax revenue and likewise card games costing $80 million in tax revenue – both over ten years. Effectively stopping all future casinos, they argue, would cost $200 million in new tax revenue for schools annually. Meanwhile, there is no news to report yet from the Florida Supreme Court on the fate of five other proposed constitutional amendments on the ballot. The Court is reviewing a claim that the five amendments were “unconstitutionally bundled,” with multiple measures in each amendment. They include Amendment 6, which creates new rights for crime victims and new term limits on judges; Amendment 7, which changes University and State College systems’ governance, while providing scholarships to survivors of first responders and military members; Amendment 9, which prohibits both offshore drilling and vaping in indoor workplaces; Amendment 10, which makes a variety of changes to state and local government structure and operations; and Amendment 11, which makes changes to property rights, obsolete sections of the Constitution, and criminal statutes. A lower court judge removed them from the ballot in September, prompting an appeal eventually to the Supreme Court. For those looking for a deeper dive, with expert fiscal analysis and economic impact of the 12 proposed amendments on the November ballot, we’re happy to share this link to the Florida TaxWatch 2018 Voter Guide. All proposed amendments to Florida’s constitution require a 60% majority vote to be approved. As many of our readers are Floridians, it’s important to know how each of these measures can affect us and our families, businesses, and employees. Knowledge is power! Election Day is Tuesday, November 6. As we put this edition of the newsletter to bed on Sunday evening, Tropical Storm Michael has developed in the lower Gulf of Mexico. It is expected to grow to hurricane strength and could threaten the northeastern Gulf Coast of Florida by the middle of this week. Twenty-six counties in Florida’s Panhandle and the Big Bend – including the city of Tallahassee – are part of the state of emergency declared by the Governor. While state resources are mobilized, we remind those in the path of the storm of the wise adage, “Run from the water, hide from the wind,” especially given the recent flooding in the Carolinas from Hurricane Florence. Please make sure your emergency preparations are underway with the hope that we won’t need them but the confidence that we’re ready. We at Lisa Miller and Associates stand ready to assist our clients with their needs prior to, during, and after the storm. Please be safe!